When discussing Symphony No. 3, Opus 36, also known as the Symphony of Sorrowful Songs, composer Henryk Górecki hoped "people [would] find something they need in this piece of music". After its premiere in 1977, audiences certainly did not and widely criticized the symphony and by default its composer. However, over the course of several decades, Symphony of Sorrowful Songs gained popularity. Perhaps, though, Górecki's Symphony of Sorrowful Songs' time is now. The release of the Polish National Radio Symphony Orchestra version, conducted by Krzysztof Pendereckir, is an emotionally sweeping and plaintive musical depiction of despair. With Portishead's Beth Gibbons as the soprano, the composition is hoisted into modernity and emblematic of the contemporary political and social turbulence. In this presentation by Domino, audiences will realize Górecki's purpose in positioning the Symphony of Sorrowful Songs as a catalyst for empathy and change. Symphony of Sorrowful Songs consists of three movements with a soprano singing Polish texts throughout. The dominant theme illustrated by Górecki is the tribulation and mournfulness rendered by familial division, specifically the separation of a mother and child. The first movement, "Lento—Sostenuto tranquillo ma cantabile", interprets a 15th-century Polish lamentation of Mary, attempting to alleviate Jesus' pain and cure his affliction. "Lento e largo—Tranquillissimo", the second movement, was derived from the short messages written on a cell wall by 18-year-old Helena Wanda Błażusiakówna. She was incarcerated by the Gestapo during World War II. Her writings were not a condemnation of her captures or a plea for release. Rather, Błażusiakówna empathizes with her mother's emotional torture resulting from her daughter's imprisonment. The third movement, "Lento—Cantabile-semplice", is taken from a folk depiction of a mother searching for her son killed by the Germans in the Silesian uprising enacted between 1919-1921. Notably, Górecki's emphasis is not a critique of the military-industrial complex or the draconian policies provoking war-mongering. Symphony of Sorrowful Songs focuses on the individual and serves as a piercing representation of the profound grief transcendent across time and space. To ensure the cultural theme's transparency, Górecki relies on simple instrumentation. The opening cello is melancholic and hushed, evocative of grief and despair's bawl. There are few crescendos and the ornamentation is stark thereby casting Symphony of Sorrowful Songs an austere exposition of sorrow. In doing so, nothing distracts or mollifies the listener. The pain is clear and unavoidable hence Górecki derives empathy from his audience. Symphony of Sorrowful Songs is marked by considerable note and musical repetition, symbolic of the ubiquity of familial separation. By evoking empathy, Górecki puts the audiences into a position of power to act and create change instead of believing in compliance and apathy. By showcasing anguish, Symphony of Sorrowful Songs is a composition akin to an advocacy piece beseeching audiences to be proactive in preventing future renditions of familial separation. Empathy and the call for humane discourses and practices are surely what Górecki hoped "people would find in his music". Unfortunately, many are not listening. Symphony of Sorrowful Songs is an unsettling reminder of the current migrant border crisis in the US and the longstanding historical practice of dividing parents from children. Echoing Górecki's narrative, the Trump administration's US-Mexican border policy centralizes disuniting families. Yet the United States has been separating families long before Trump. The practice occurred throughout the Japanese internment and the forced enrollment of Native American children in boarding schools. Severing community and family ties is slavery's cornerstone, then and now. And these are just US-centric examples. The separation of families has been a ploy established across the globe. Much as Górecki understood the historical longevity of this catastrophe, he could not predict the future demonstrations. However, it is not shocking the players and geography have changed but the harrowing act remains the same. As a member of Portishead and substantiated by her solo-career, Beth Gibbon's music is defined by its emotional weight. As the soprano for Symphony of Sorrowful Songs, her performance is likewise as affecting as it is impressive. She does not speak Polish yet learned the language necessary to precisely perform the work. Her voice is especially crystalline on the articulation of the word "mama" serving as an ideal conveyance of Górecki's intent. In this recording, she never falters or hesitates, her voice is confident and resolute. Her range is breathtaking, her soprano register soars and acts as a decisive counterpoint to the bewailing strings. Her pitch is not entirely soothing but neither is Symphony of Sorrowful Songs' design. It is apparent she is embodying the narrative lamentations and using her voice to alleviate the emotional turmoil. She complicates the audiences' pleasure acquired from musical reception while creating an unforgettable impression. Symphony of Sorrowful Songs is vital listening. 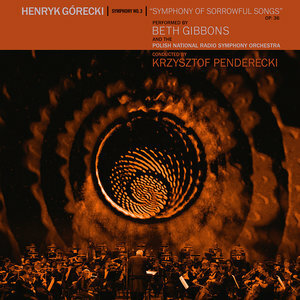 The collaboration between Gibbons, the Polish National Radio Symphony Orchestra, and Maestro Penderecki endows the human spirit with palpability while manifesting sorrow's pervasiveness.